Over the next 12 weeks, On the Ground will take an in-depth look at Covington, Ky., the region’s second-largest city and a hotbed of cultural and economic growth opposite downtown Cincinnati. Our team will offer insight into the people, places and projects that have long defined Covington, while exploring its strategy for building a bright future and lasting legacy. While Cincinnati urbanists have long been preoccupied with developments in Over-the-Rhine, Walnut Hills and Price Hill, a sleeping giant lies just south of the Ohio. Covington, Ky., a 14-square-mile city neatly tucked between the Ohio and Licking rivers, offers both a window into our region’s Appalachian and German past — a place where sweet tea and local beer are served in equal proportions — and a glimpse of a thriving future that hinges on smart redevelopment, a wildly diverse business community and passionate residents as agents of lasting change. The city of Covington has remained remarkably intact since the 19th century, when much of its urban housing stock and business districts were built. Today, the city’s aesthetic is a mix of historic preservationist and modern urbanist, with many of its 19 neighborhoods still optimized for walkability. Even in outlying areas, front-porch sitting abounds, harkening back to the heyday of traditional city planning. Covington is the fourth-largest city in Kentucky, with more than 40,000 residents. While, like many urban areas, the city struggled to maintain a steady population and economic viability through the last half of the 1900s, its economic comeback in recent decades has incentivized large-scale employers like Fidelity Investments, the IRS and St. Elizabeth Healthcare, as well as a roster of small businesses and startups, to invest in citywide development. Though still slightly below statewide averages, Covington residents are riding a steady increase in per capita and household income levels. Property values increased over 35 percent, while overall crime decreased between 2000 and 2015. Couple that marked progress with job growth and affordable housing that rivals even Cincinnati’s most desirable neighborhoods, and it’s no wonder that Covington is fast becoming an attractive option for transplants and longtime residents alike. Covington's distinct-but-interconnected neighborhoods stretch from the riverfront south past the I-275 interstate loop. (For reference, find a neighborhood map to the right.) Those nearest the riverfront — including Licking Riverside, the Central Business District, Westside, Seminary Square, Mutter Gottes and Mainstrasse — have experienced the most visible change in recent years. This steady revitalization comes at the hands of both community organizations and motivated Covington residents like Paul Weckman, who, with his wife Emily Wolff, owns popular Mainstrasse restaurants Otto’s and Frida 602. At just 22 years old, and with twins on the way, Paul and Emily purchased a building on Main Street and prepared to open their first restaurant. It was a bold move; their twins were born just weeks later. The pair’s goal with Otto’s was to offer more than just a culinary experience. Weckman was inspired by the time he spent in France during college, studying the food and wine economy. He was struck by how personalized and life-giving the restaurant experience could be for a community. “I fell in love with the idea of small, one-off restaurants run by families who were in touch with their community,” he says. Otto’s opened in 2003, and for the next seven years, the family lived above the restaurant. When it was time to shop around for a larger home, they considered other places, but couldn’t imagine leaving the neighborhood. Thy took another big gamble when, in 2010, they began renovating a large, vacant rectory a few blocks from the restaurant. Fourteen years, three more children and another restaurant later, Weckman and his family have become central figures in Covington food, art and community development. The family’s latest project involves renovating residential and mixed-use properties on the southern edge of Mainstrasse. Weckman is a familiar face on Main Street, but he spends a lot of time off the beaten path. The cobblestone alleyways off Main Street offer a more nuanced view of Covington development.Weckman feels the cobblestone passageways of Mainstrasse Village tell a more nuanced story of Covington. While visitors on Main Street see the finished product, he sees the construction crews at work. He watches new residents — mostly young professionals and empty-nesters — welcomed by longtime residents who have owned their homes for generations. From his perspective, Covington is a model urban community, a place where you can still buy a house, start a business and raise a family all within a few city blocks. Meanwhile, his wife Emily is active in other community issues. With a background in fine arts, she’s helping organize a massive renovation project at Goebel Park, as well as a community art project at the Sixth Street underpass that connects Mainstrasse to the Mutter Gottes neighborhood and the Central Business District. The project, funded by a People’s Liberty grant, will use artistic lighting and design to connect all three districts for increased walkability and citywide engagement. Paul and Emily are just two of many passionate Covington residents who double as planners, developers, artists, placemakers and leaders. Many newer residents are drawn to the city’s historic infrastructure and affordability. But Weckman says Covington has a certain “grit” that can’t be found in the fast, big-money developments of larger cities. It’s that unquantifiable quality that drew him to Covington, and he’s excited to welcome new residents who are committed to maintaining historic flavor while improving the city on all levels. He believes many of the new residents are in it for the long haul. Elsewhere in Covington real estate, two major developments are currently unfolding: the forthcoming John R. Green Lofts at W. Sixth Street, and Duveneck Square next to Braxton Brewery on W. Seventh. These two developments alone will bring roughly 300 new rentals to the area. While Covington has no shortage of beautiful historic homes, high-density housing has long been in short supply. Weckman hopes the next housing wave will bring renovated low-income rentals. There are existing buildings that could accommodate that type of development, Weckman says, but they need upgrading. Mainstrasse’s charming façade captures a lot of media coverage, but the area makes up just one component of Covington’s vast identity. To its east are the neighborhoods of Mutter Gottes (also known as Old Town) and the Central Business District, which runs south along Madison Avenue from the river to Eighth Street. Renaissance Covington, an award-winning affiliate of the Main Street America program, has been instrumental in revitalizing Covington’s Central Business District and connecting like-minded groups with a shared goal of citywide transformation. Under the leadership of executive director Katie Meyer, the organization focuses on creative placemaking, economic development and community events to raise Covington’s profile as a great place to live, work and play. "Pennies From Heaven" mural at 4th and Scott streets.Though the riverfront neighborhoods provide the most visible examples of Covington’s revitalization, there are many other key players driving the city’s success. Covington is home to a diverse array of residents, investors and community-based organizations like The Catalytic Fund of Northern Kentucky and the Center for Great Neighborhoods, which work collaboratively to breathe new life into both the city’s high-profile neighborhoods and its next frontiers. 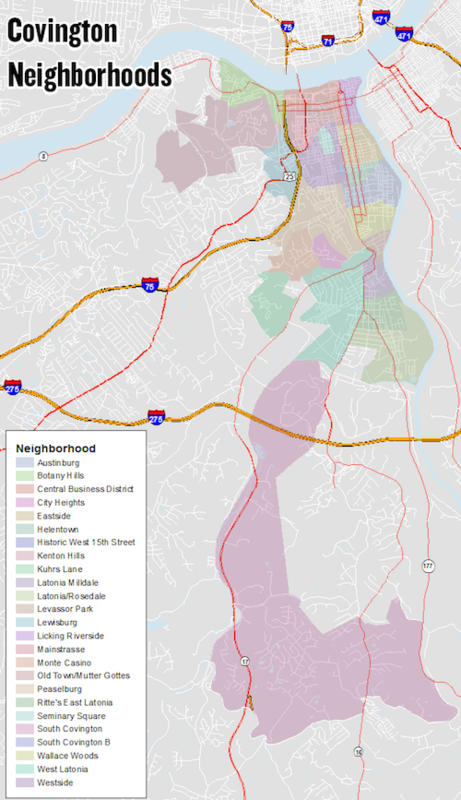 Meanwhile, a long list of cultural and community assets make Covington a central component in our regional identity; a newly expanded MLK/12th Street business district, Licking River Greenway and Trails, historic Ritte’s Corner in Latonia, Devou Park in Kenton Hills and the historic residences of Wallace Woods are just a few examples — and there are hundreds more. Join On the Ground as, over the next 12 weeks, we uncover more of the people, places and projects that make Covington unique. We will explore the city’s long-established and burgeoning arts scenes, talk with business leaders of every stripe, learn more about citywide health and wellness initiatives and explore leaders’ strategies for educating the next generation of Covingtonians. The giant is waking, and its story is just beginning. The Northern Kentucky Fund of the Greater Cincinnati Foundation is proud to underwrite Soapbox’s On the Ground: Covington series. The Northern Kentucky Fund believes that highlighting the successes and challenges in our community fosters effective dialog and action, creating communities where everyone can thrive. Other On the Ground partners include The Center for Great Neighborhoods, which is working collaboratively toward community transformation with series sponsor Place Matters partners LISC and United Way of Greater Cincinnati. Data and analysis is provided by The Economics Center. There's much more to Covington than meets the eye. With 19 distinct neighborhoods stretching from the riverfront beyond the I-275 loop, the city's landscape ranges from urban cobblestone to bucolic farms — and its residents are no less diverse. Click to enlarge the neighborhood map and add the list of events below to your calendar. We'll be updating the list throughout the summer, so be sure to check back regularly.